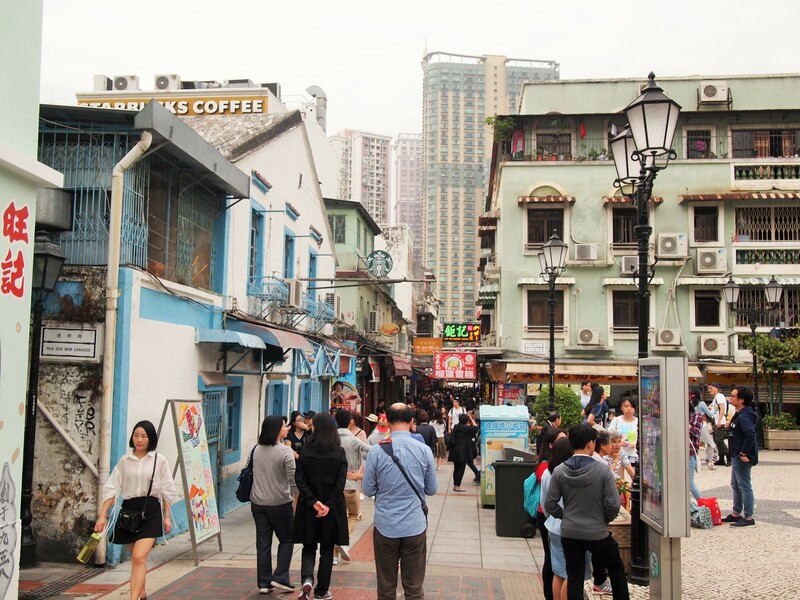 On our third day in Macau we took the bus over to Taipa, the island closest to the peninsula. 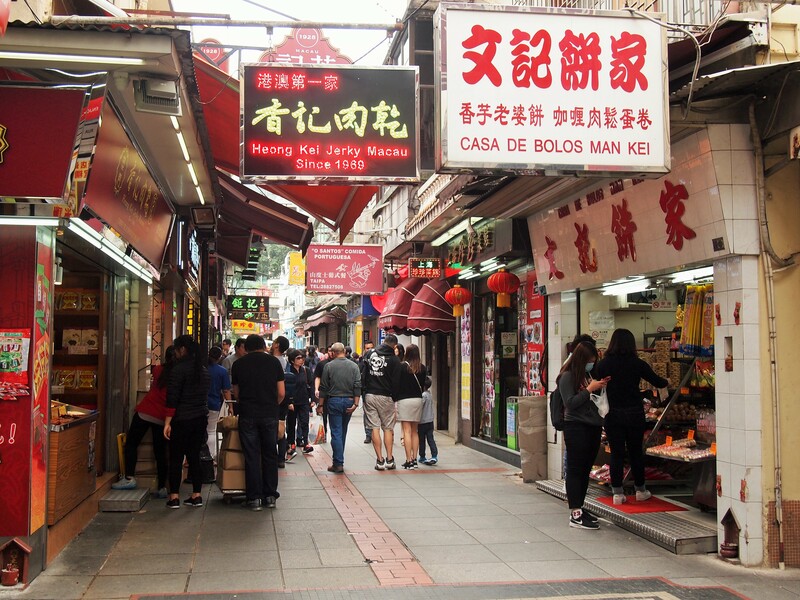 Originally a collection of small fishing villages, Taipa became the center of Macau’s firecracker industry after a devastating explosion on the peninsula in 1925. 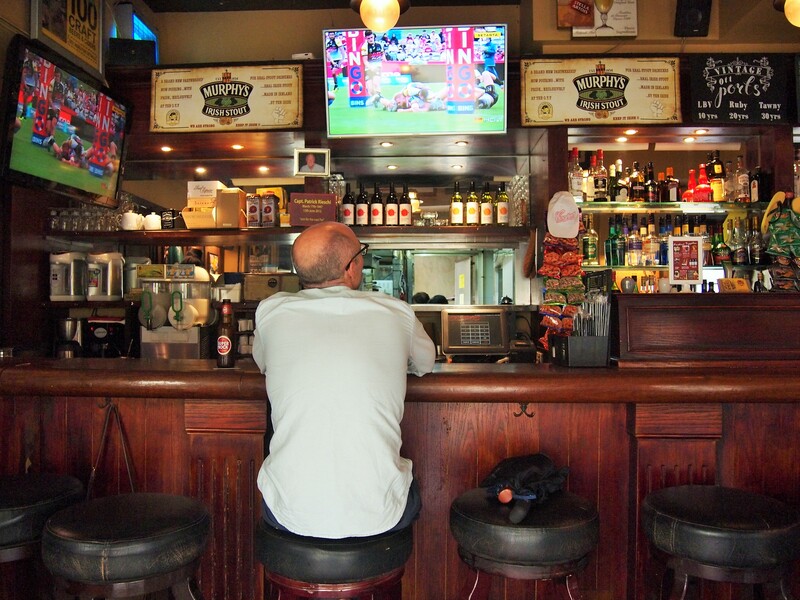 By the 1970s, the industry faced stiff competition and waned. 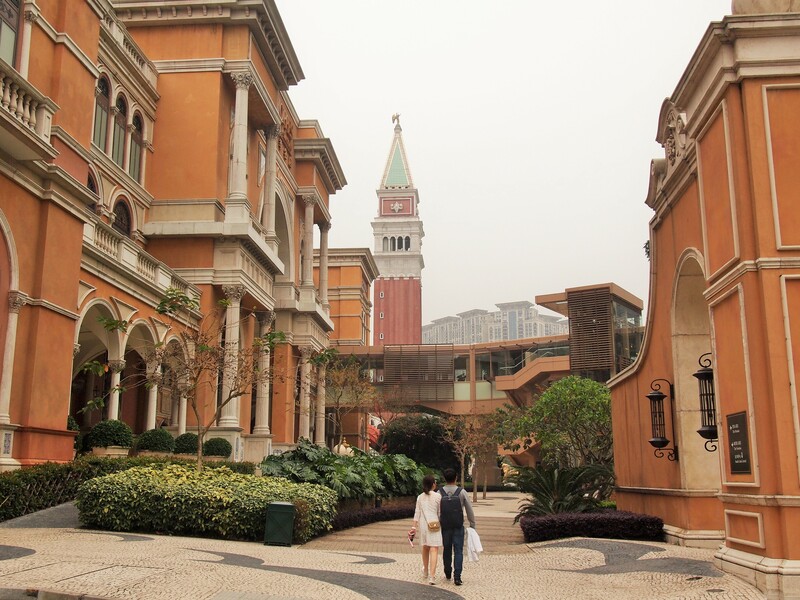 Today, Taipa’s focus has transitioned to the robust gambling industry of Cotai, a reclaimed strip of land connecting Taipa and Coloane. 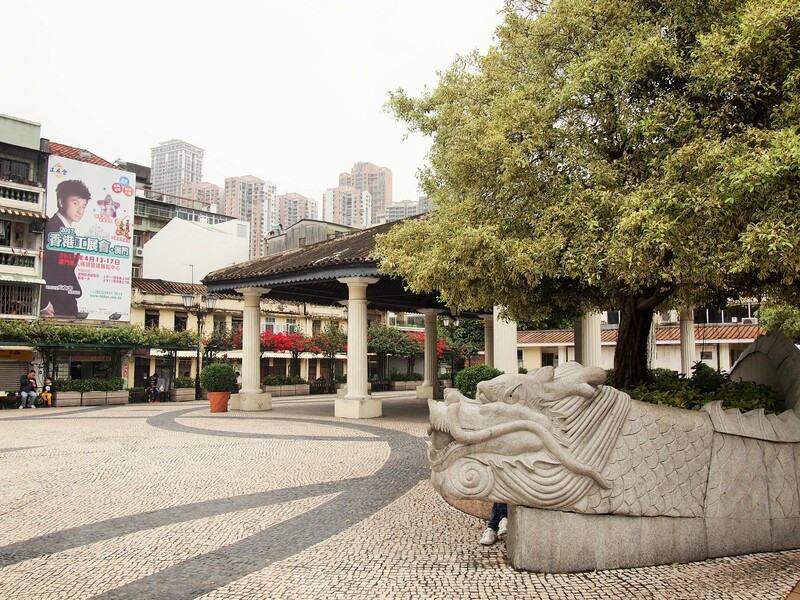 On the southern end of Taipa, where Cotai now begins, Taipa Village is the destination for tourists. 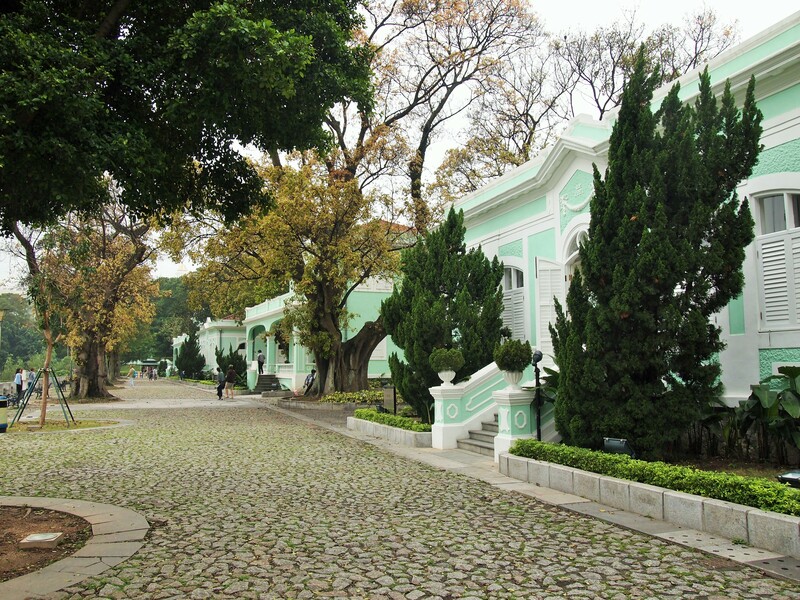 A collection of colonial-era buildings and squares, Taipa Village is truly quaint. 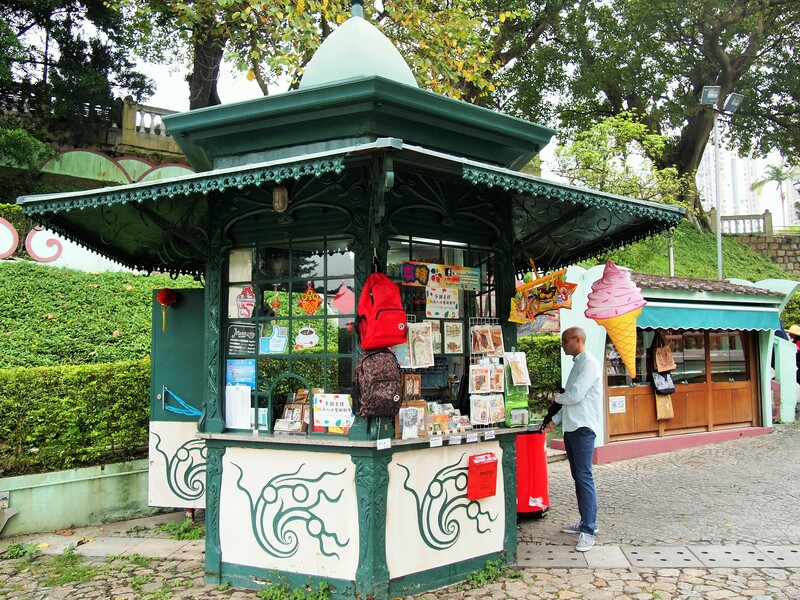 It’s fairly small making it incredibly easy to walk around without a destination. We had a couple places in mind we wanted to see, but for the most part we wandered around aimlessly without an agenda. 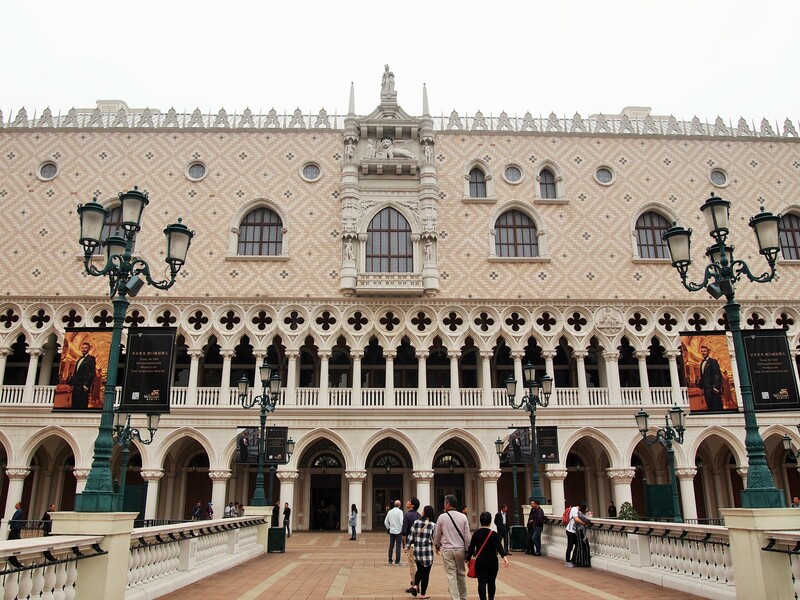 It was the most effortlessly enjoyable day we spent in Macau. 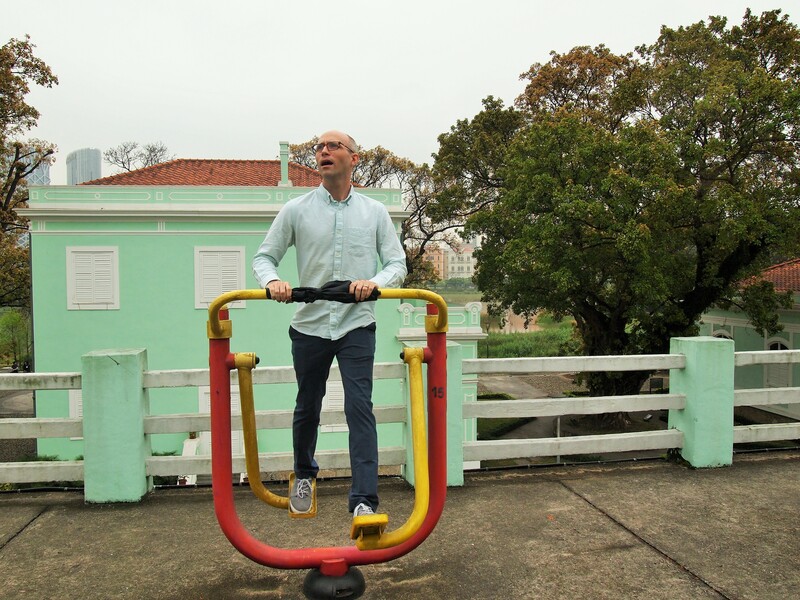 The bus dropped us off right at the top of Rua do Cunha, next to a small plaza. 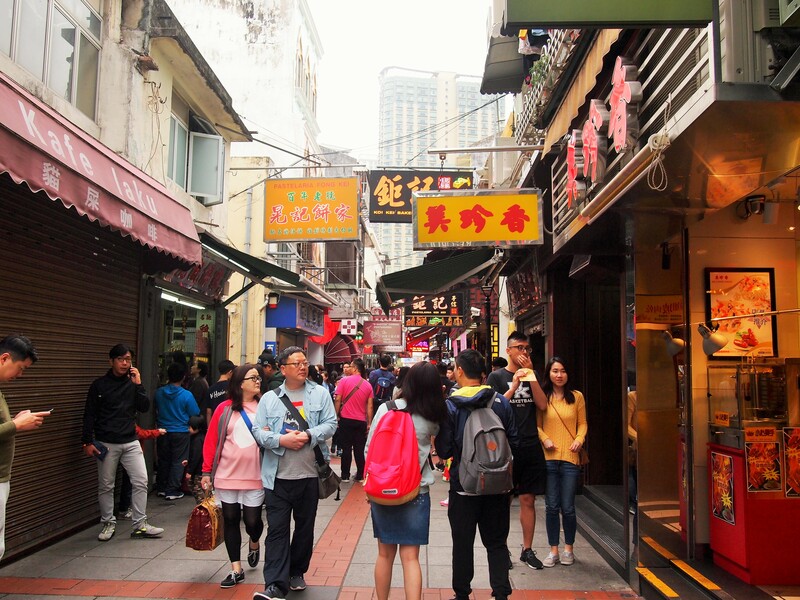 We tended to start our day earlier than most tourists in Macau and the street and plaza were fairly empty when we first arrived. 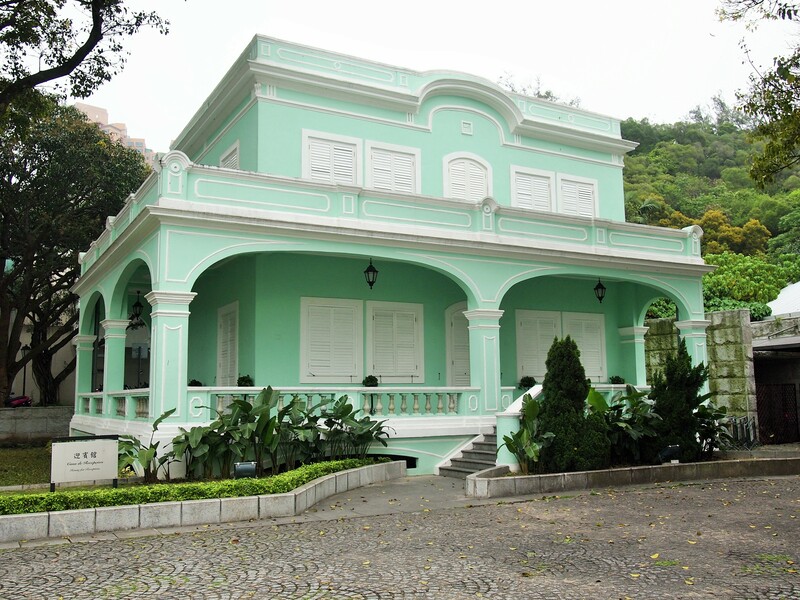 We decided to start with the place I wanted to visit most, Casa Museu, or Taipa House Museum. 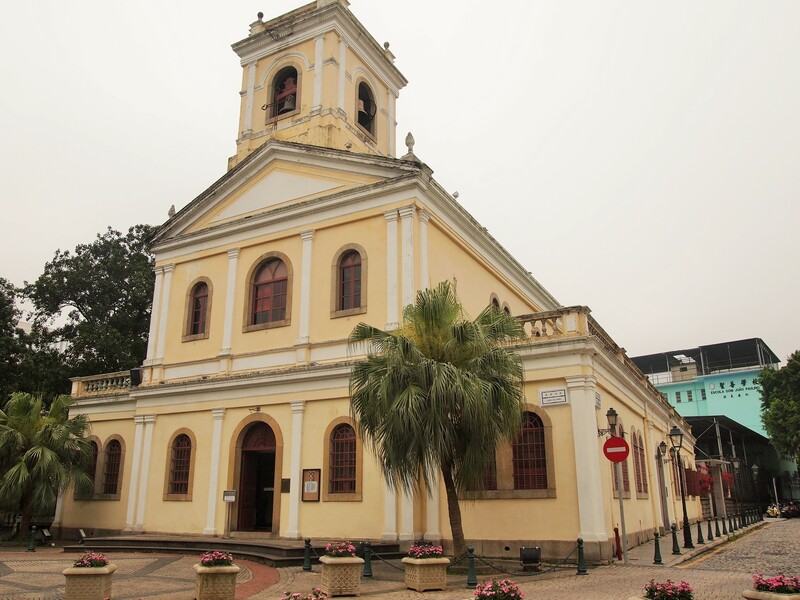 On our way we passed Igreja do Carmo, Lady of Carmel Church, with a wedding party out front. 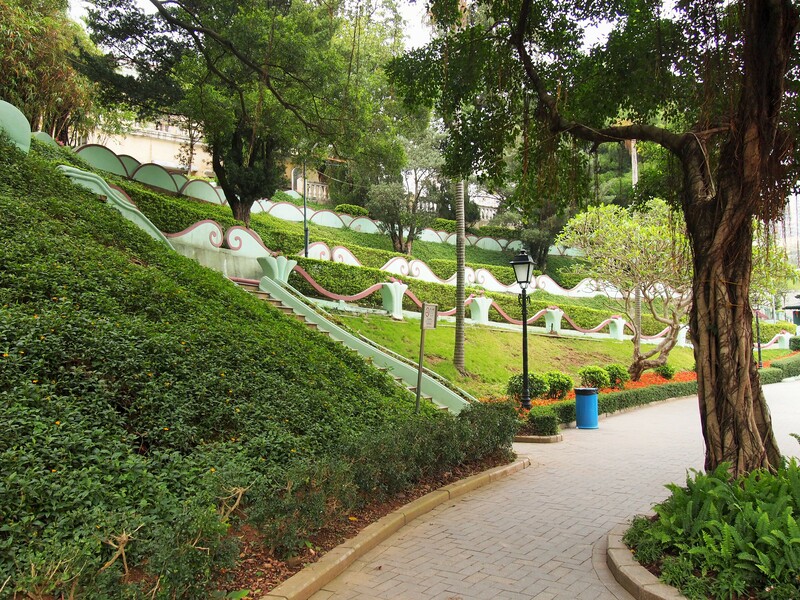 I snapped a quick photo and then we continued along to Carmo Garden and the House Museum below. 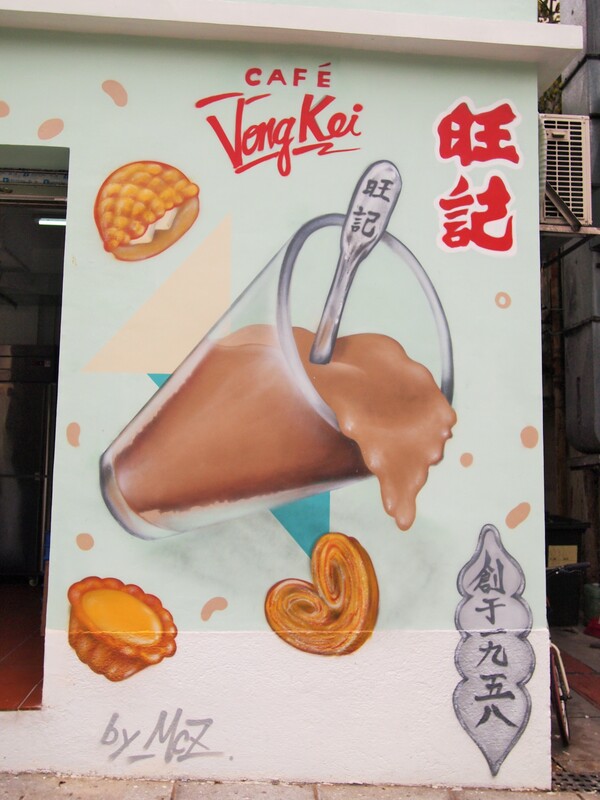 This mural didn’t help my coffee craving but their sausage bun was delicious! 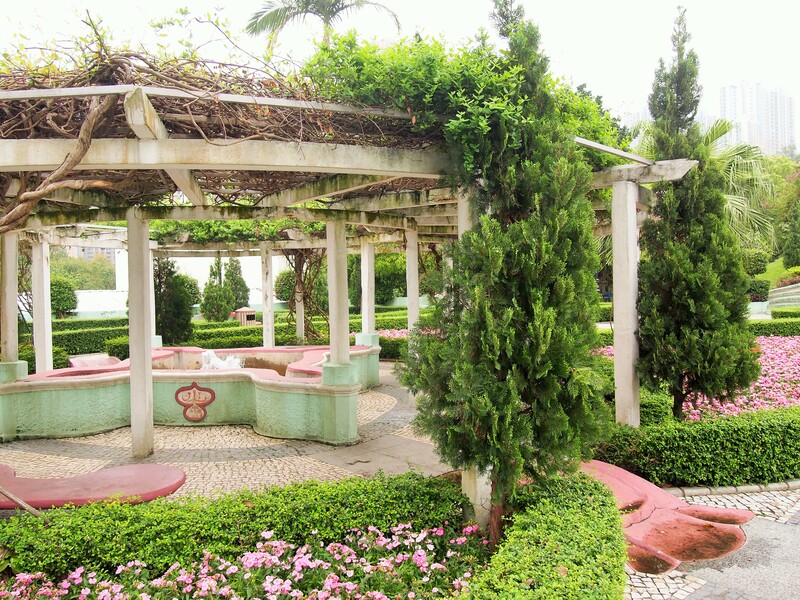 Along what used to be a mangrove swamp, five colonial-era homes have been preserved. Originally used for Portuguese civil service employees, they are a vivid lime green color and have been preserved in different capacities. Only one house has been fully preserved in its original form. The others have been converted to art exhibition spaces and only three were open at the time of our visit. 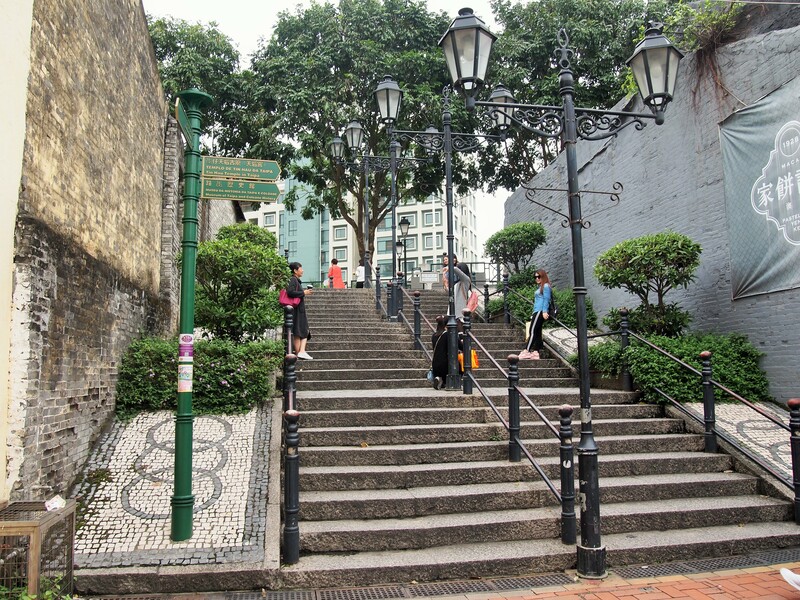 We walked to the end and worked our way back up starting with a photography exhibition on Macanese traditions. 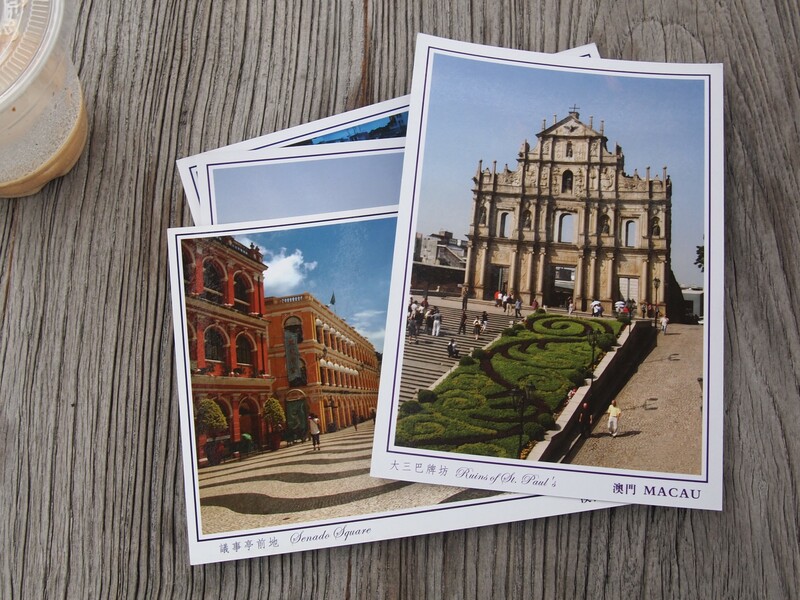 It was a collection of photographs of weddings, parties, and other gatherings of Macanese families. 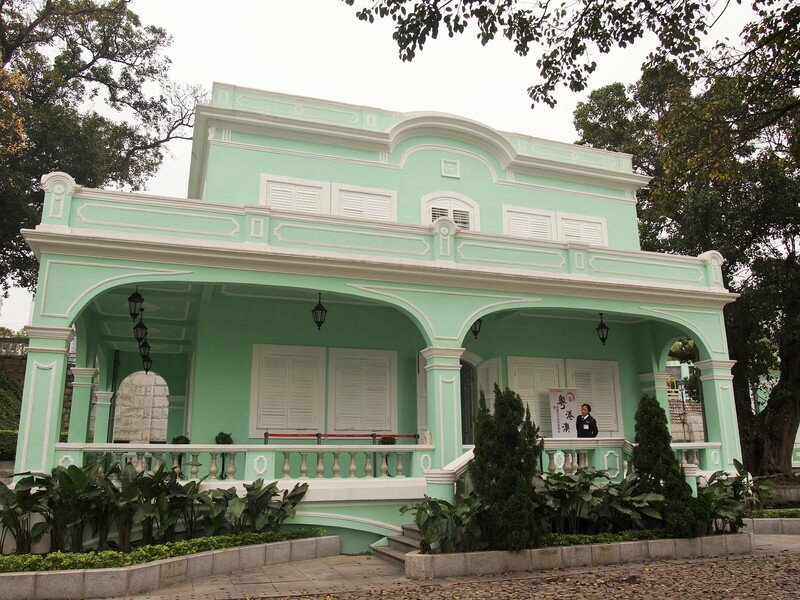 The best exhibit, and the one I preferred, was the Macanese Living Museum, an example of how the homes would have been used and decorated at their prime. 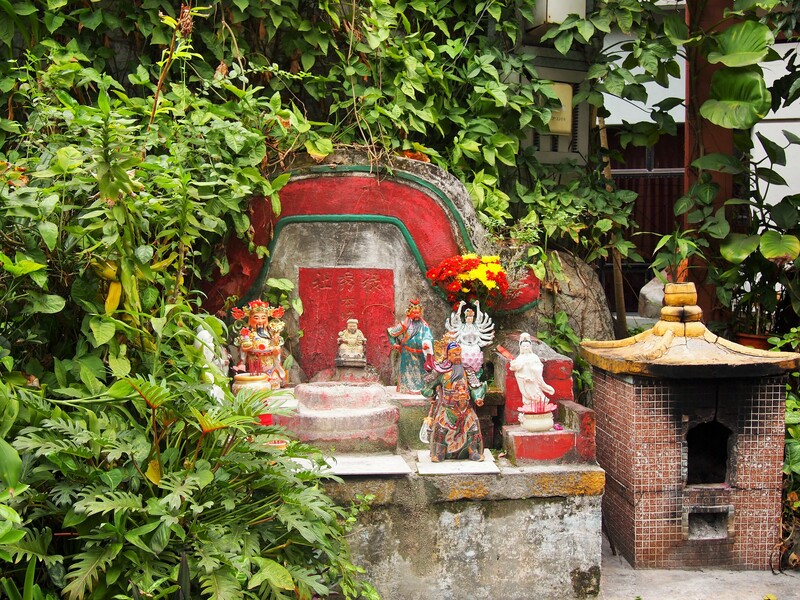 Directly across from the Taipa Houses is Cotai – on a clear blue day the view would have been quite striking. 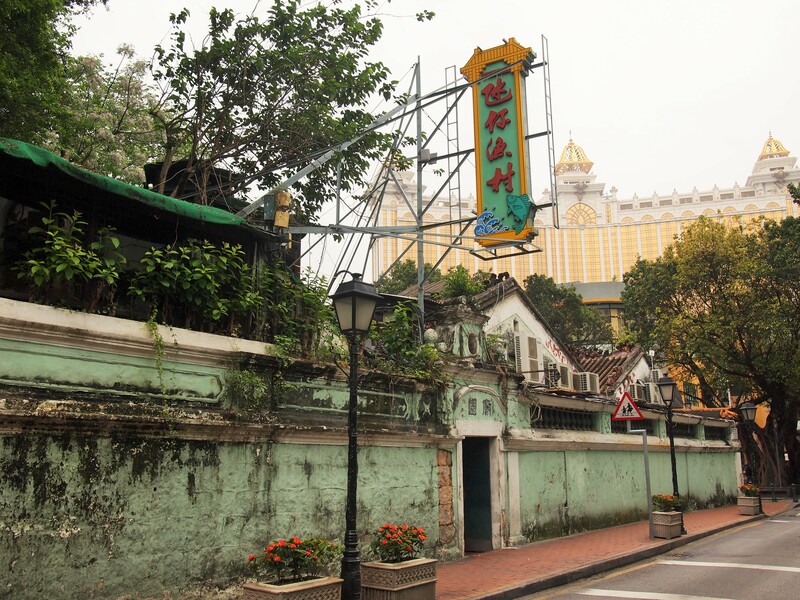 Macau legalized gambling in 1847 in an effort to combat the loss of trade income to Hong Kong. 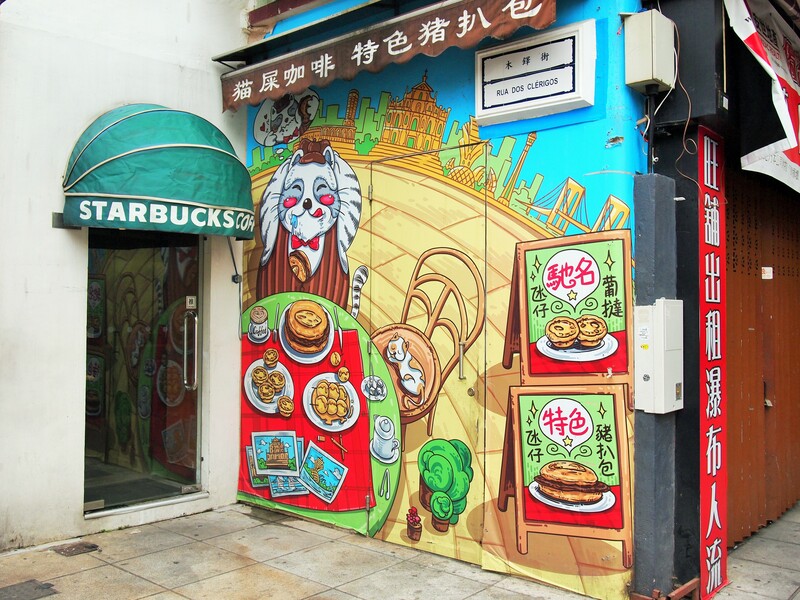 When China regained control of the territory in 1999, it became the only place in China where gambling is legal. 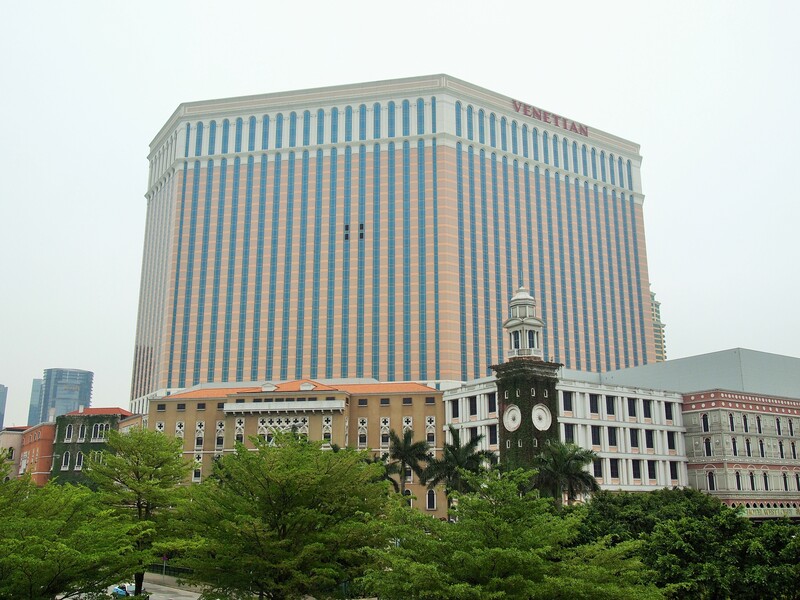 Though casinos have long been on the peninsula, Cotai is a recent creation. 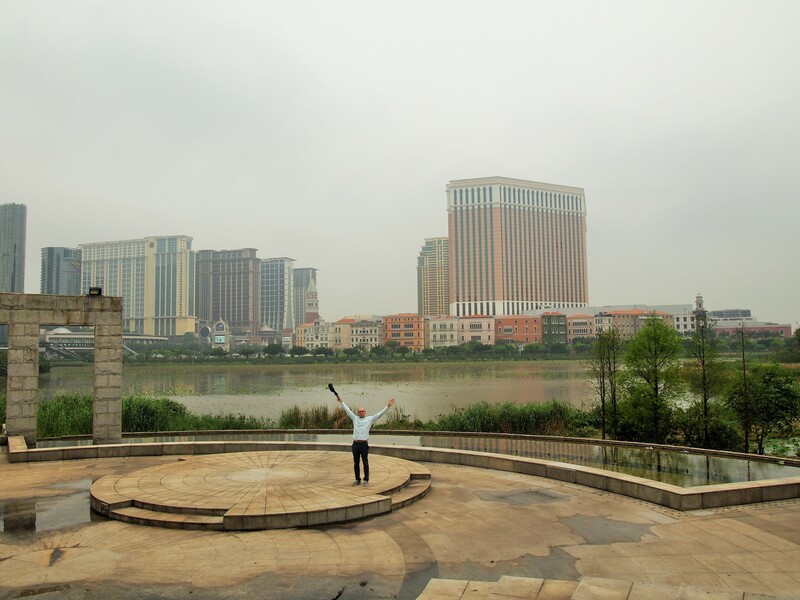 Through a land reclamation project, the government created the landfill that is now Cotai in the early 2000s. 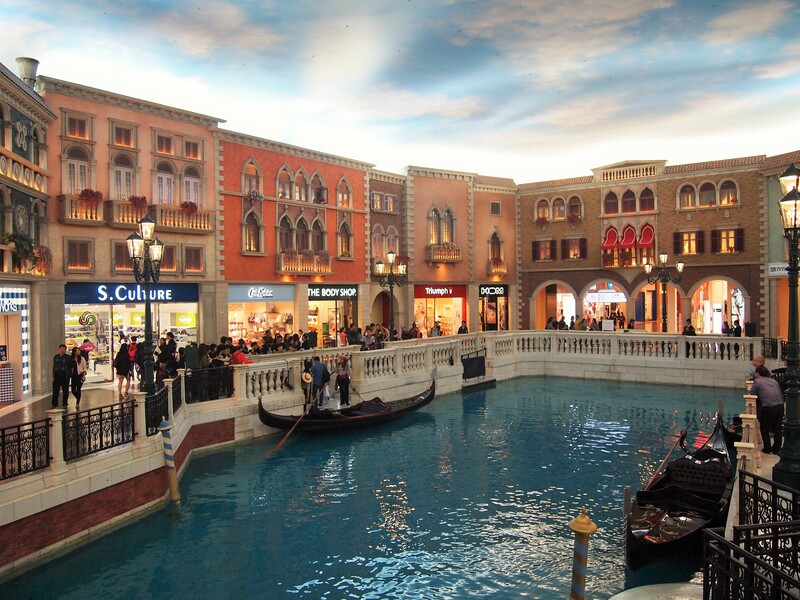 It is the next phase in Macau’s quest to fulfill its destiny as the Vegas of the East. 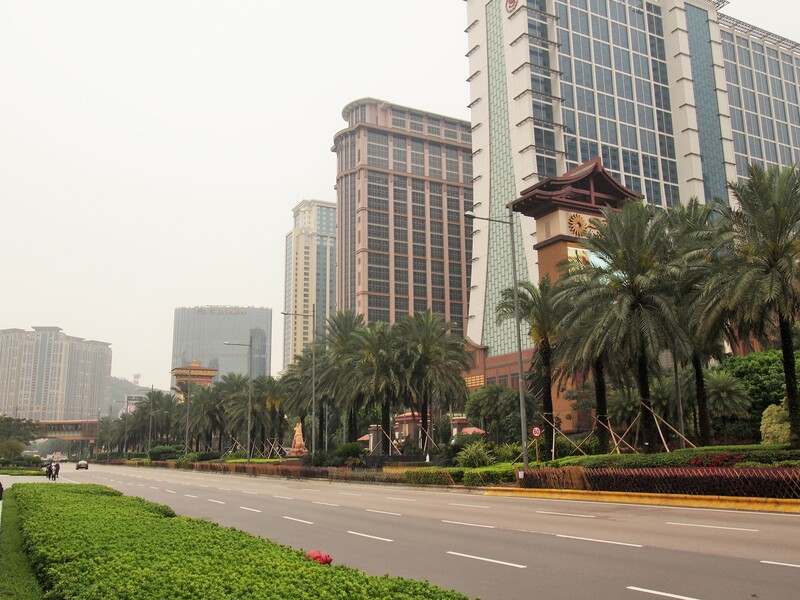 The Cotai Strip, a boulevard of casinos reminiscent of Las Vegas, was the vision of Las Vegas casino magnate and Sands CEO, Sheldon Adelson. 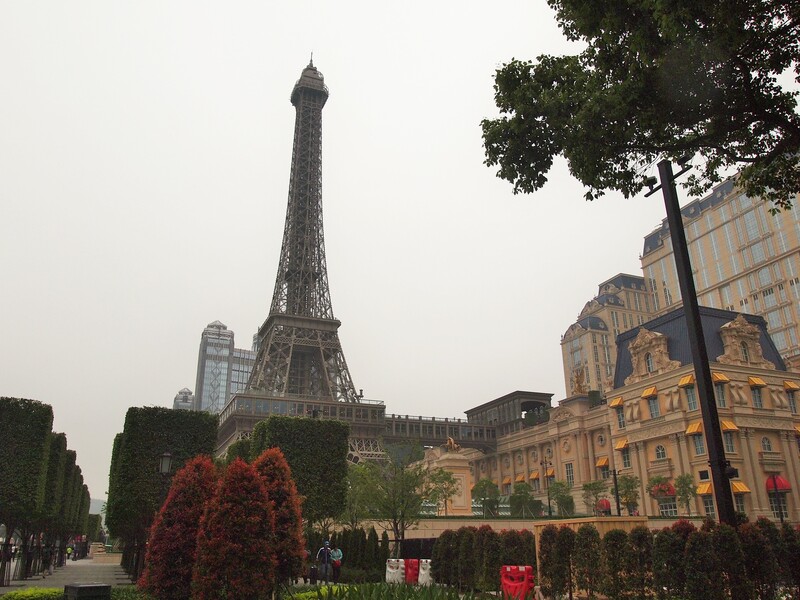 In fact, the Sands essentially owns the Cotai Strip, dominating the western side of the strip with The Venetian, The Plaza, and the newly opened, Parisian. 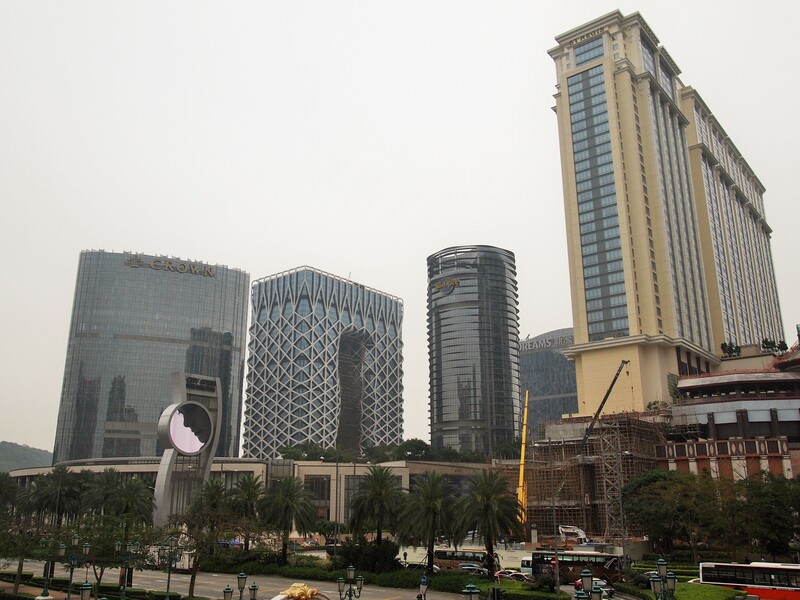 On the opposite side is the Sands Cotai Central which is a collection of four widely-known hotels (St. Regis, Conrad, Sheraton Grand, and Holiday Inn) all connected via shopping malls, convention halls, and restaurants. It’s massive. 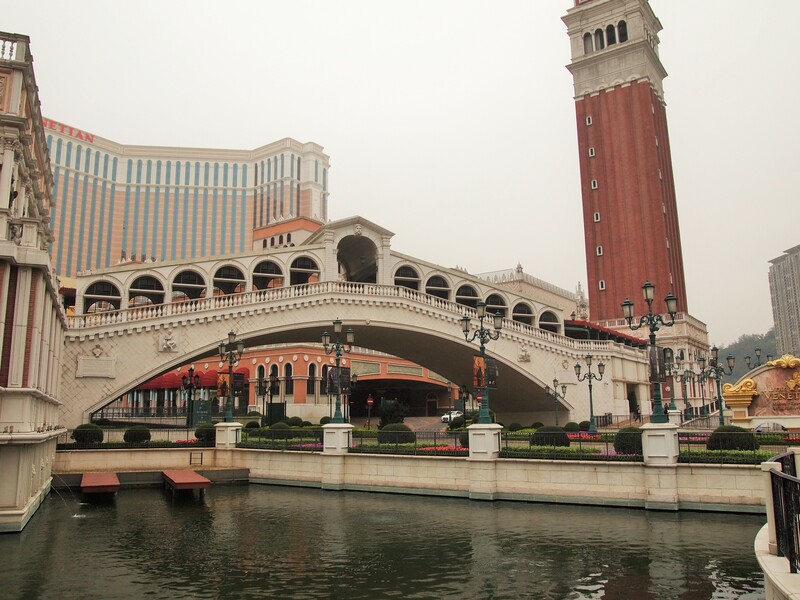 Of course, the Sands doesn’t own everything, everyone is getting in on the action – Wynn and MGM among others. 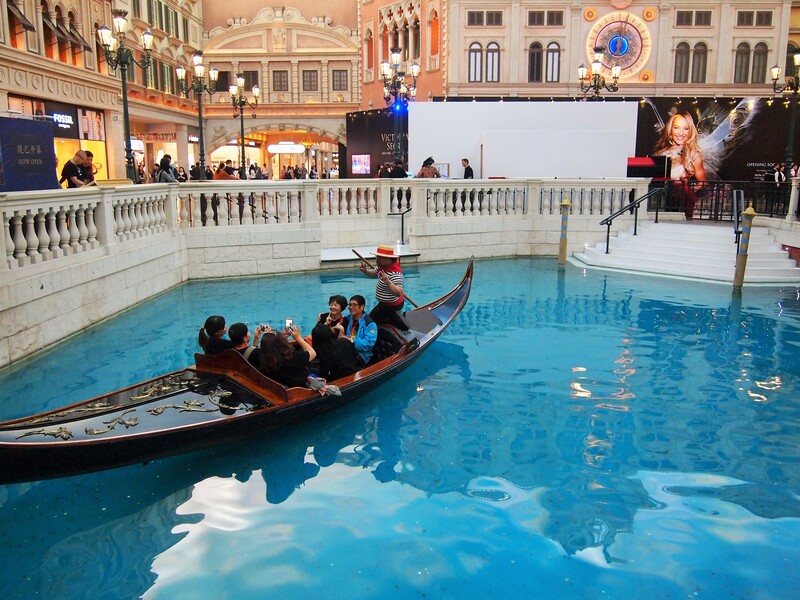 None of this is my cup of tea in the least, but you’ve gotta give Adelson credit for envisioning this strip when it was still under water, literally. 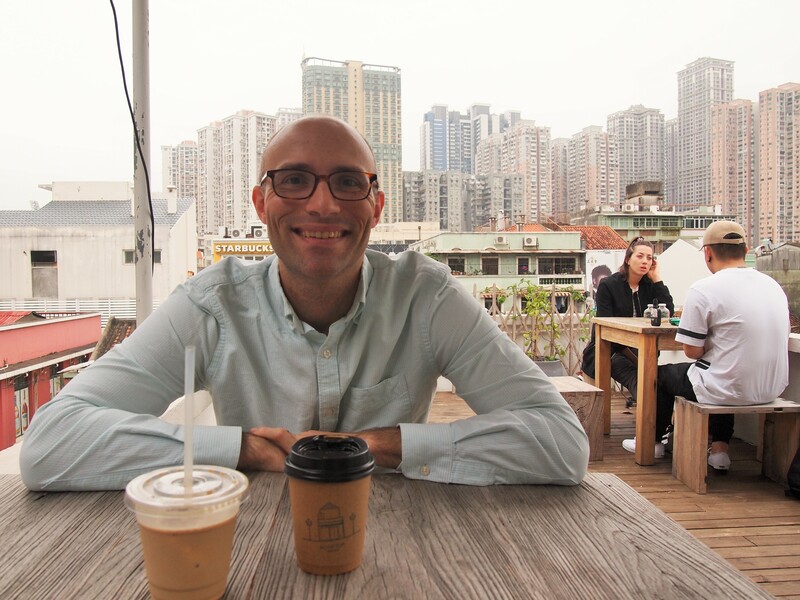 Back in Taipa, we took a break at Rooftop Macau, a sweet little coffee shop with a balcony overlooking Rua do Cunha, the main street in Taipa Village. 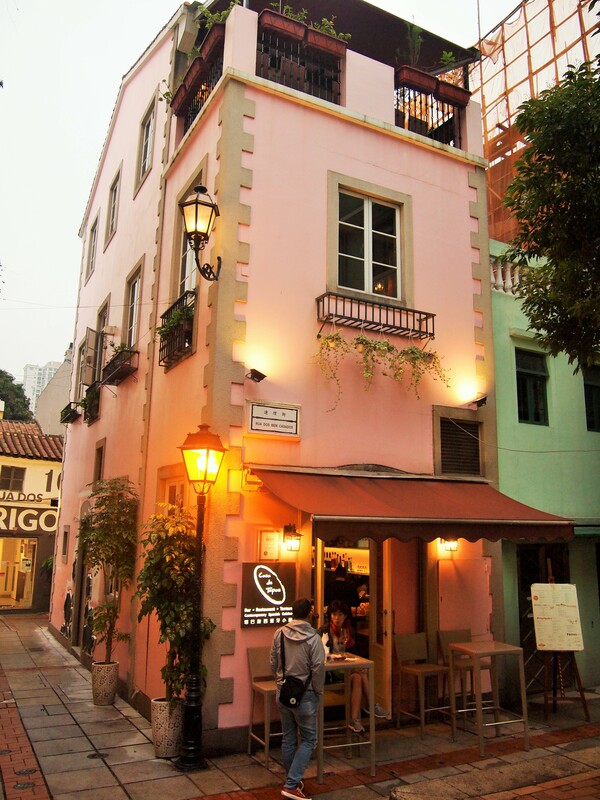 Rua do Cunha is closed to car-traffic and feels more like a wide sidewalk than a street. 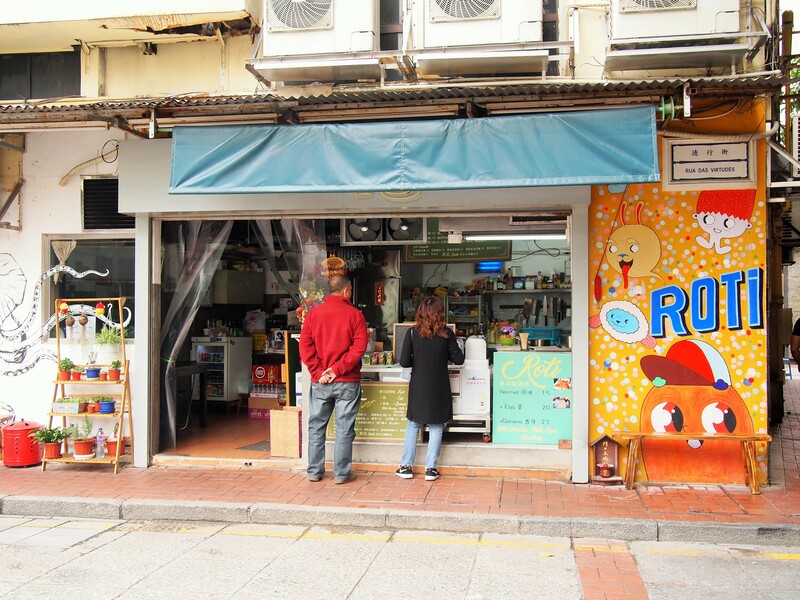 The lane is lined with food vendors, pastelerias, and souvenir stores. 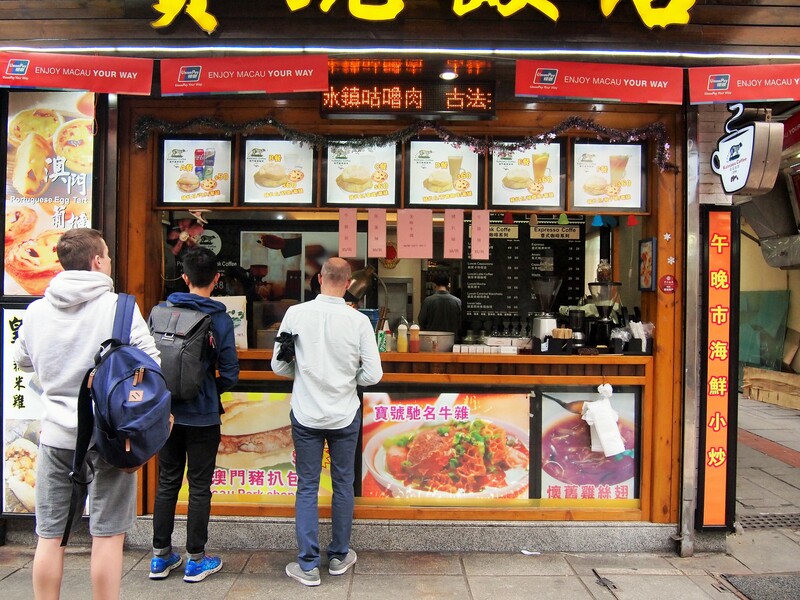 The signature street food in Taipa is the pork chop bun. 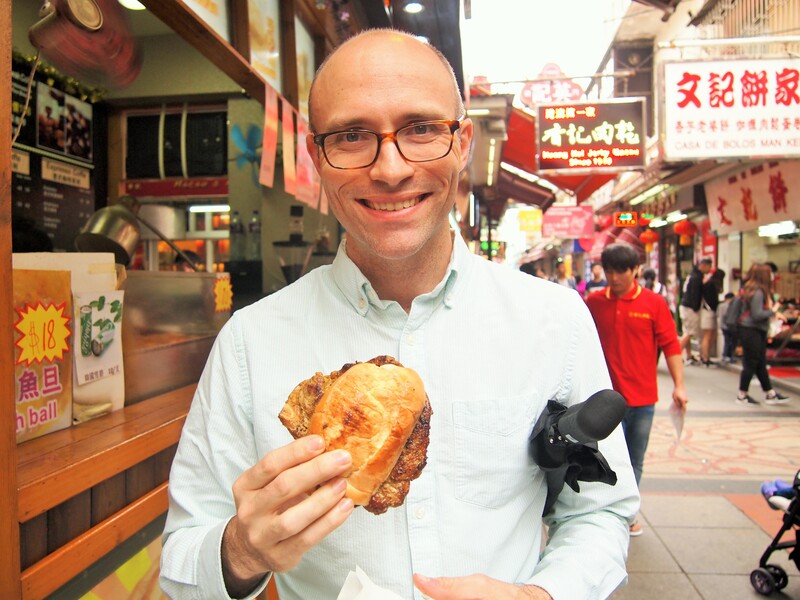 It’s exactly how it sounds – a bone-in pork chop in a bun. Zach bought one for us to split, and it was really enjoyable (and cheap!). 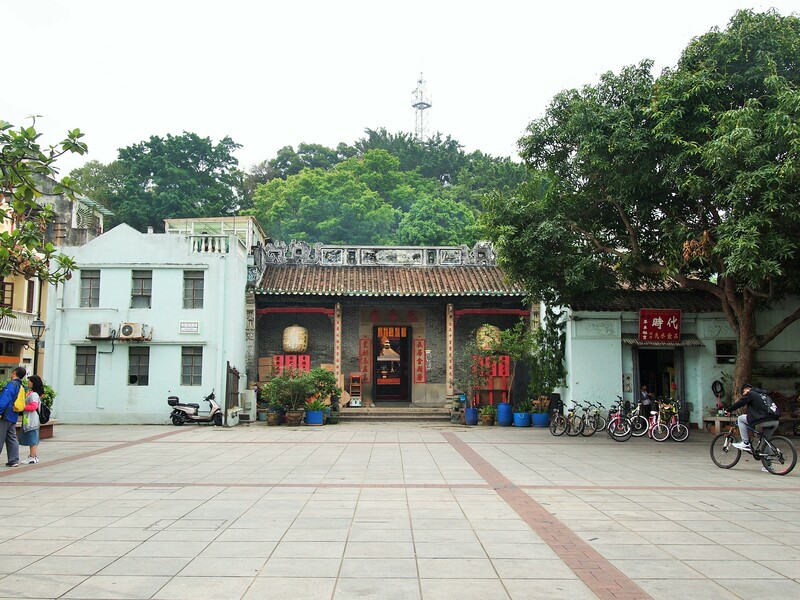 We walked around with our pork chop bun winding our way through alleys until we stumbled upon Pak Tai Temple in an open plaza. 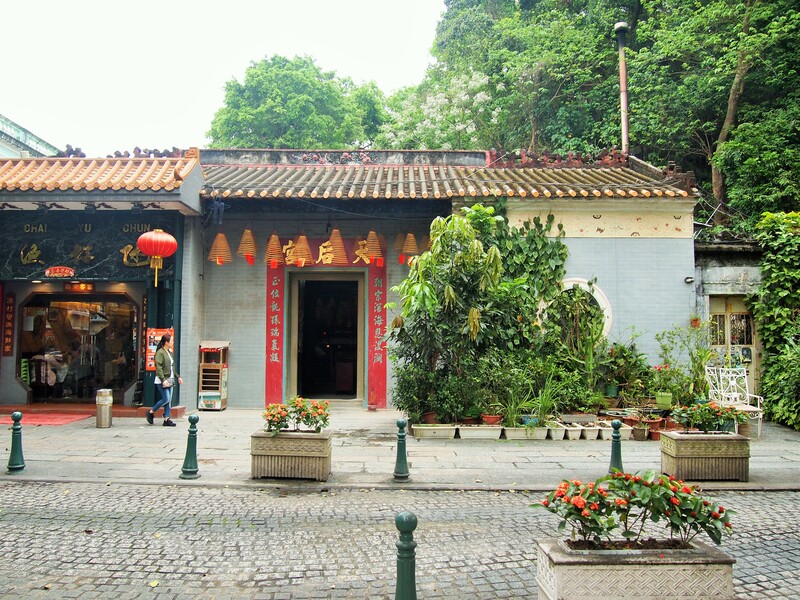 Then we wound our way over to the Museum of Taipa and Coloane History. 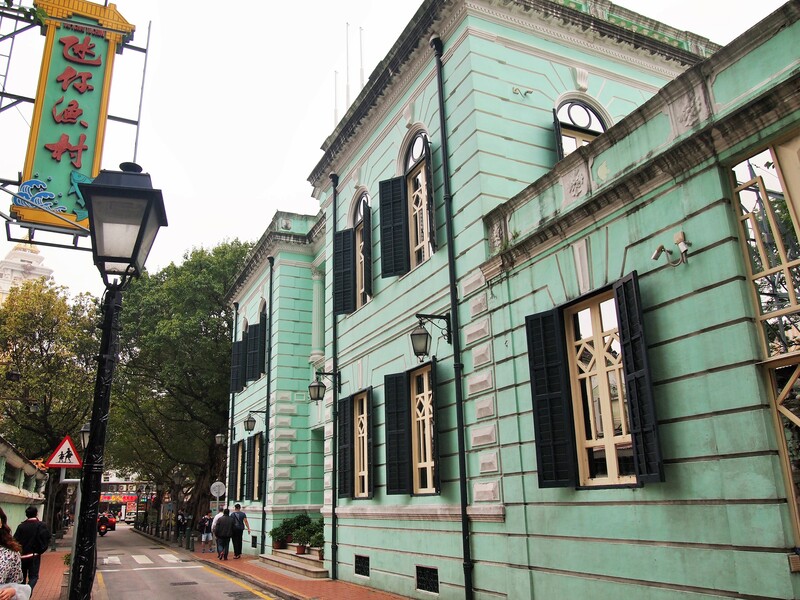 The building was formerly a public administration building and now houses a small collection of artifacts from Taipa and Coloane. On the bottom floor were items uncovered in several excavations on Coloane and upstairs there were exhibitions about the islands as they existed under Portuguese control and after. Like most of the museums we visited, there were no other tourists. 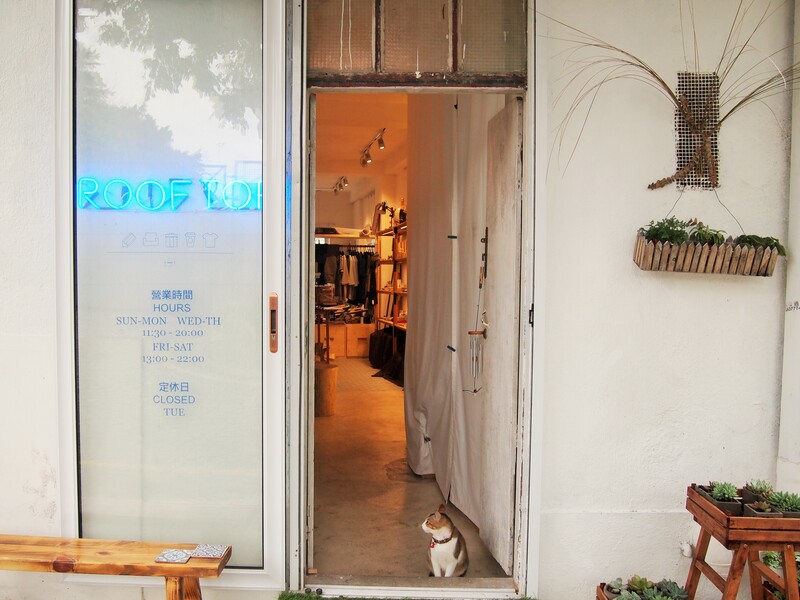 Though small, I found the exhibits interesting and provocative. 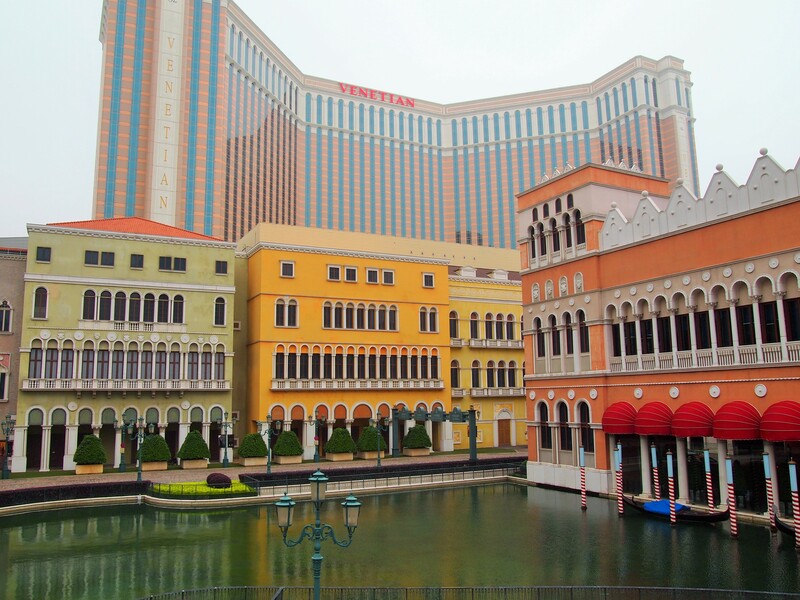 It gave me a sense of what the islands were like before the casinos. 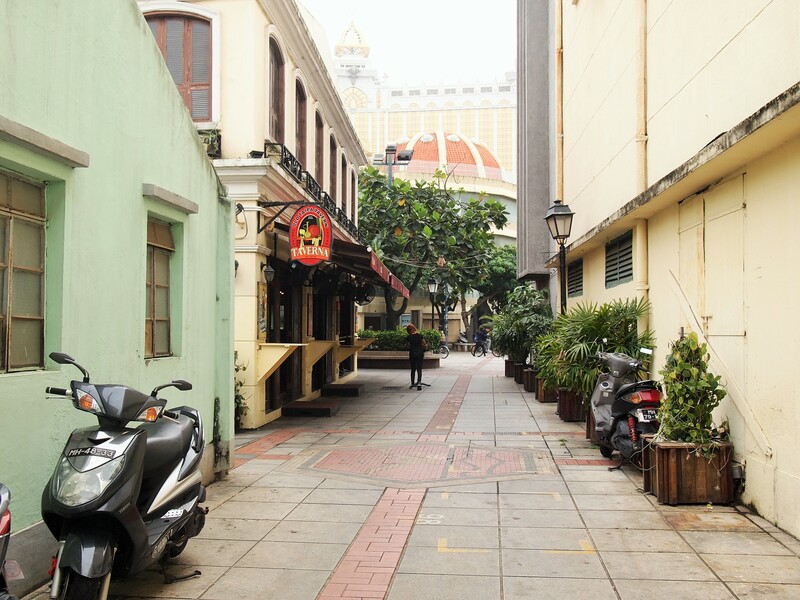 After we left the museum, we decided to go have a beer at Old Taipa Tavern which we’d passed earlier next to the plaza with Pak Tai Temple. We had good timing as shortly after we sat down at the bar it started to rain lightly. We passed a good hour or so there and had a snack of chicken fingers there before deciding to go have tapas elsewhere. The rain had stopped and we walked through the alleys to find Casa de Tapas which is housed in an attractive Portuguese building. 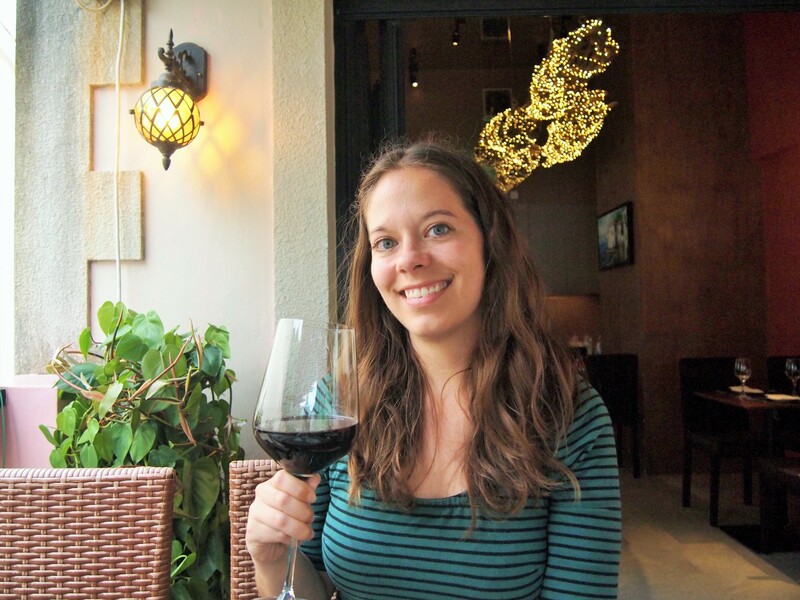 We opted to sit on the balcony and had wine with a variety of delicious tapas before catching the bus back to the peninsula. 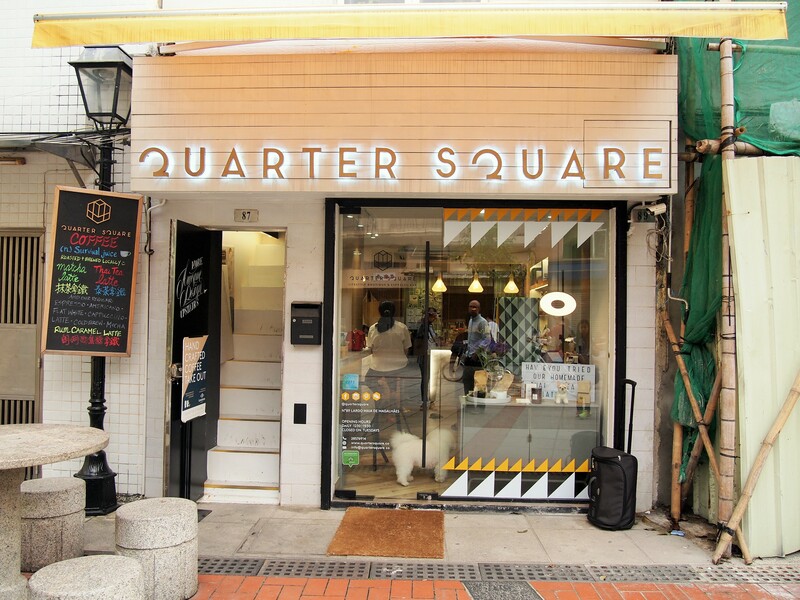 We stopped in Taipa Village once more after a day in Coloane to have coffee at Quarter Square, a hip coffee shop with a French bulldog mascot. 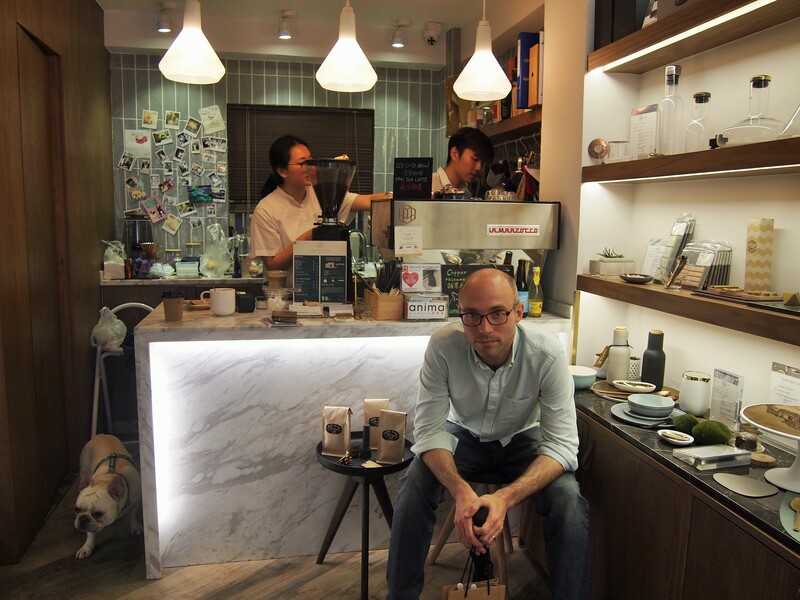 They, too, had a rooftop patio and we enjoyed an afternoon coffee after a kind of odd day in Coloane – but that’s for next time.